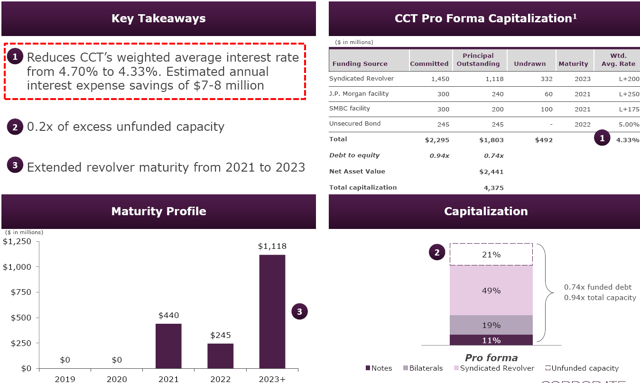 For Q2 2018, CCT hit my base case projections with dividend and fee income of $15 million (compared to projected $11 million) and covered its dividend and repurchased almost 2.5 million shares. 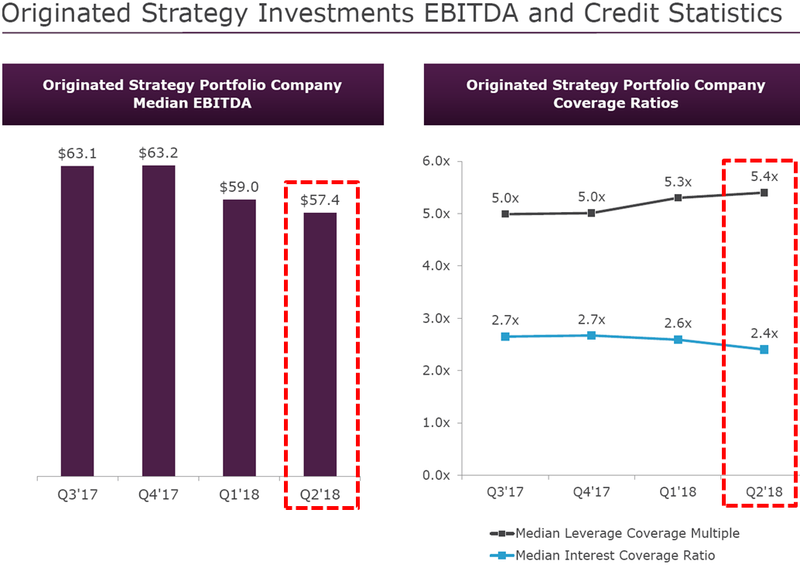 FS/KKR Advisor announced a new $3.435 billion credit facility L+1.75% to 2.00% that should add $0.02 per share of quarterly NII for CCT. 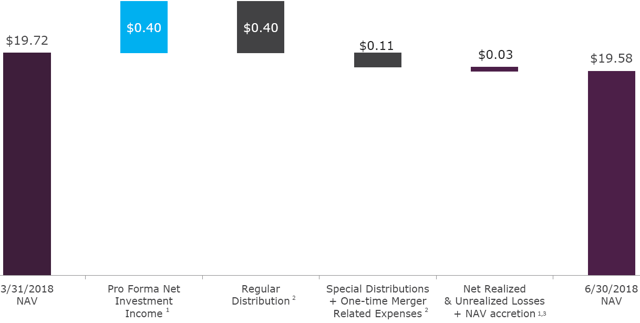 NAV per share declined by $0.14 or 0.7% (from $19.72 to $19.58) mostly due to the special dividend of $0.10125 per share and of “one-time listing/merger expenses”. 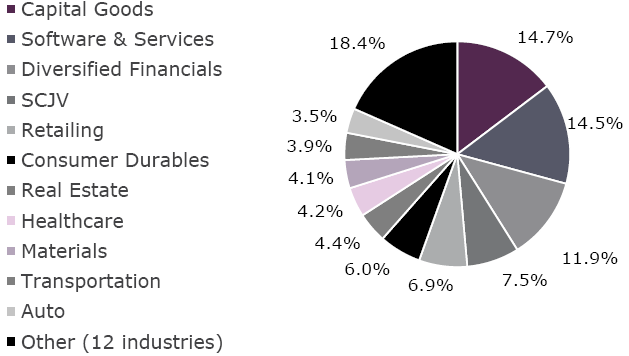 Non-accruals have been mostly retail/energy and recently decreased to 1.5% of portfolio FV due to exits/restructuring. ZGallerie, LLC was added to non-accrual status during the quarter. Portfolio credit metrics continue to decline from the previous quarters, including cash flow leverage and coverage ratios,and need to be watched. The following is a quick update that was previously provided to subscribers of Premium Reports on August 9, 2018. 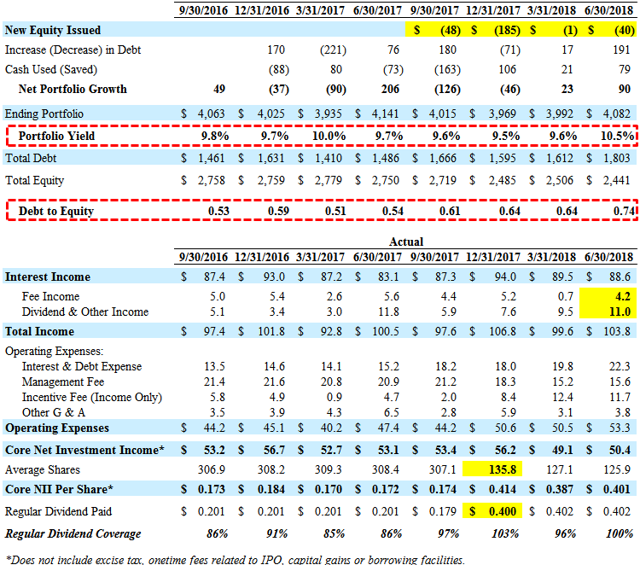 For target prices, dividend coverage and risk profile rankings, credit issues, earnings/dividend projections, quality of management, fee agreements, and my personal positions on all BDCs (including this one) please see Deep Dive Reports. For the quarter ended June 30, 2018, Corporate Capital Trust (CCT) hit my base case projections with dividend and fee income of $15 million (compared to projected $11 million) and covered its dividend by 100% after excluding $1 million of “one-time listing/merger expenses”. Its portfolio yield increased from 9.6% to 10.5% partially due to increased “annual amortization of the purchase or original issue discount” as calculated by the company. 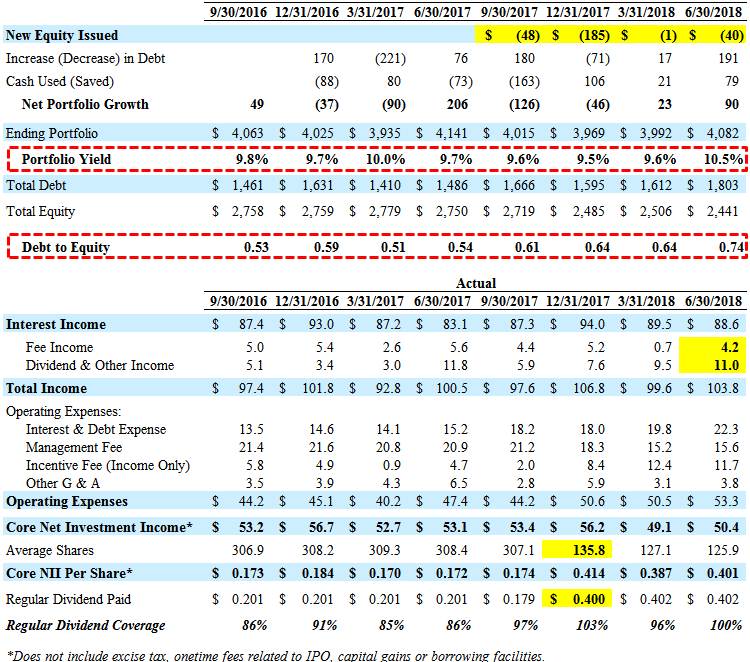 Portfolio growth was lower-than-expected but its debt-to-equity is now 0.74 and closer to its targeted leverage not taking into account almost $90 million in cash. The board of directors declared a regular quarterly cash distribution in the amount of $0.402 per share, which will be paid on October 9, 2018, to shareholders of record as of September 28, 2018. Previously, the board declared a special cash dividend of $0.10125 per share payable on May 21, 2018, to stockholders of record as of the close of business on May 14, 2018. On August 9, 2018, FS/KKR Advisor announced the closing of a new $3.435 billion, five-year senior secured omnibus revolving credit facility priced at LIBOR plus an applicable spread of 1.75% or 2.00%, depending on collateral levels. CCT has been allocated $1.45 billion of the new facility that will be used to payoff its current credit facilities at higher rates and improve CCT’s net interest margins over the coming quarters. The company has estimated a total annual saving of $7 million to $8 million or around $0.02 per share per quarter. Net asset value (“NAV”) per share declined by $0.14 or 0.7% (from $19.72 to $19.58) mostly due to the previously discussed special dividend of $0.10125 per share and of “one-time listing/merger expenses”. Markdowns for the quarter included the Home Partners of America, Inc,. Z Gallerie, LLC and Hilding Anders as well as restructuring of its investment in Proserv Acquisition, LLC. Non-accruals decreased from 2.4% to 1.5% of the portfolio fair value due to exiting its investment in Willbros Group and converting its investment in Proserv Acquisition, LLC to equity. Z Gallerie, LLC was added to non-accrual status during the quarter, which is another retail-related investments. Hilding Anders, Rockport (Relay), Petroplex Acidizing, Inc., and AltEn, LLC also remain on non-accrual. It should be noted that most of the previous and current investments on non-accrual are related to exposure to the energy and retail sectors that I have taken into account when assessing its risk ranking and pricing. 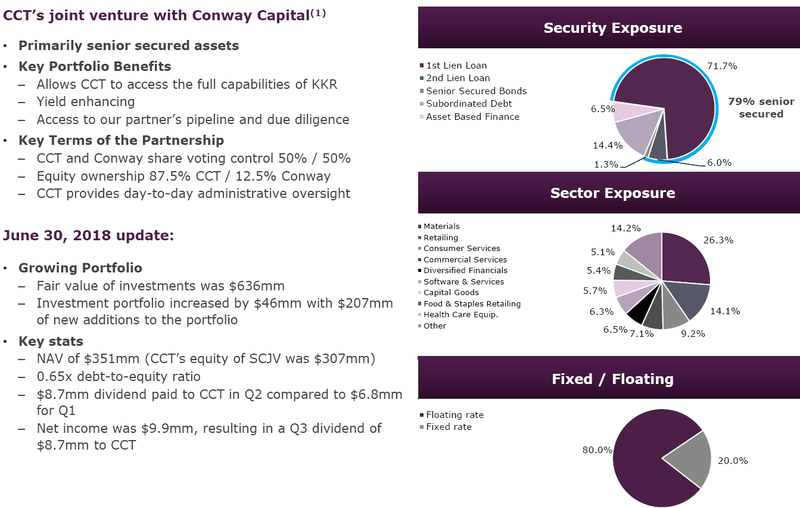 CCT has around 39% of its portfolio is first-lien debt and another 31% in second-lien and ‘other senior secured’ debt for a total of almost 70% in senior secured debt. In May 2016, Strategic Credit Opportunities Partners (“SCJV”), a joint venture with Conway Capital, was formed to invest in middle market companies. As of June 30, 2018, the SCJV accounted for around $307 million or 7.5% of CCT’s total portfolio and paid a dividend of $8.7 million during the quarter (up from $6.8 million the previous quarter). It should be noted that the SCJV had one holding on non-accrual status representing 8.0% and 7.8% of total investments on an amortized cost basis and fair value basis, respectively. In March 2018, CCT’s board of directors authorized a $50 million stock repurchase program and through June 30, 2018, CCT repurchased 2,467,458 shares for $41.07 million and an average price per share of $16.64 (16% discount to previous NAV of $19.72). As mentioned in previous posts, the base management fee was reduced from 2.0% to 1.5% of assets and the incentive fee of 20% includes a lookback feature.